INCREDIBLE! 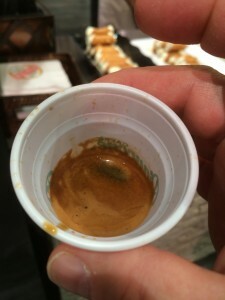 That’s the adjective that best described the experience of attending my first Pizza Expo. The idea that every major vendor of any kind: cheese, meat, utensils, cutters, signs, pos systems, ovens, etc, would all be under one roof was like an invitation to a candy store for a 9 year old. It was exactly that- with seminars! After reading the amazing selection of possible seminars given by top names in the industry, I was a bit overwhelmed. 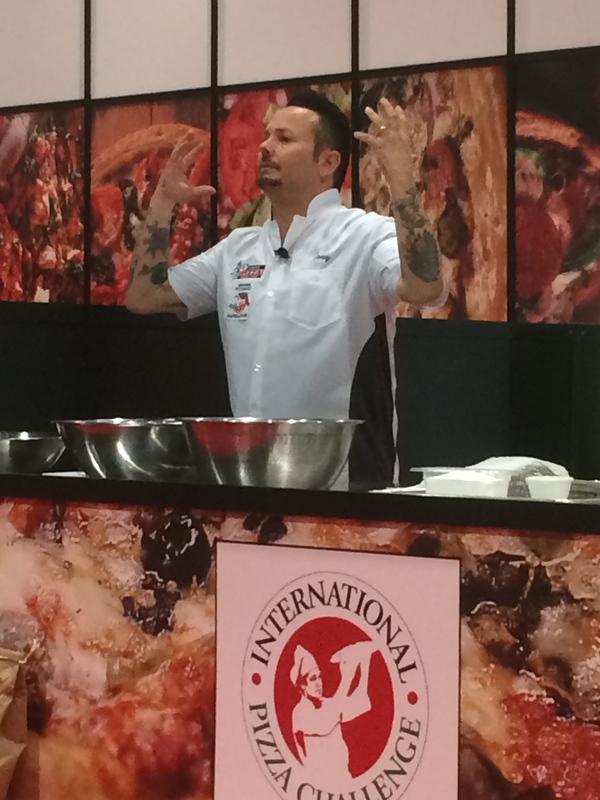 One thing was for certain- I was taking Tony Gemignani’s two-day course on flour and pizza making. There were a good 100-150 people there each morning at 8am ready to learn. Being the New Yorker I am, it was time to network and turns out there were some super-nice people there all at various stages of their pizza-making careers. Some had many stores, others weren’t even open yet. Having only been open 4 months, we were still in the learning phase of how to better our product, improve processes and customer satisfaction. That’s why I was there. We were already off to a fine start given it was the dead of winter in Estes Park. For those back east, it would be like opening up a restaurant on Fire Island in December… crickets. But, there are 4000 or so inhabitants here in Estes Park and quite a few of them have been in and a good percentage are regulars. So, how did it go? I could hardly sleep the night before given I was about to hear the guy who has revolutionized pizza over the last two decades and have a shot at making pizza with him. What I didn’t know is that I would be one of only two people to stand next to him and make pizza. Was I nervous? A little. The excitement of being critiqued by the equivalent of Picasso with a pizza, was overwhelming. There was a great deal of information shared and quite a few hard earned tips. This made the price of admission a pittance. In the above photo, he is discussing Neapolitan Margherita dough which is what I made a pizza with. (the photo was taken by Jim of JJ’s in Fort Collins. He and his wife were beautiful people whose company I enjoyed. Can’t wait to visit with them again.). The hydration of his dough was rather high making it incredibly soft. I had never had or felt dough that soft. Just another day for him, a revelation for me. As I was working with the dough, he spoke of not working the bubbles out of it completely and to be “gentle”. I thought of all the people using dough presses and dough sheeters. The difference in our dough from being “gentle” is nothing short of amazing. Tony explained the differences between flours, hydration percentages, when to use a higher protein flour, yeast, the benefits of Caputo 00 flour, how to make a starter and more importantly, why. Then he passed around starter so we could all smell and touch it. Equally important was the heat imparted on dough by our mixers. One day, it will be nice to have a better mixer. 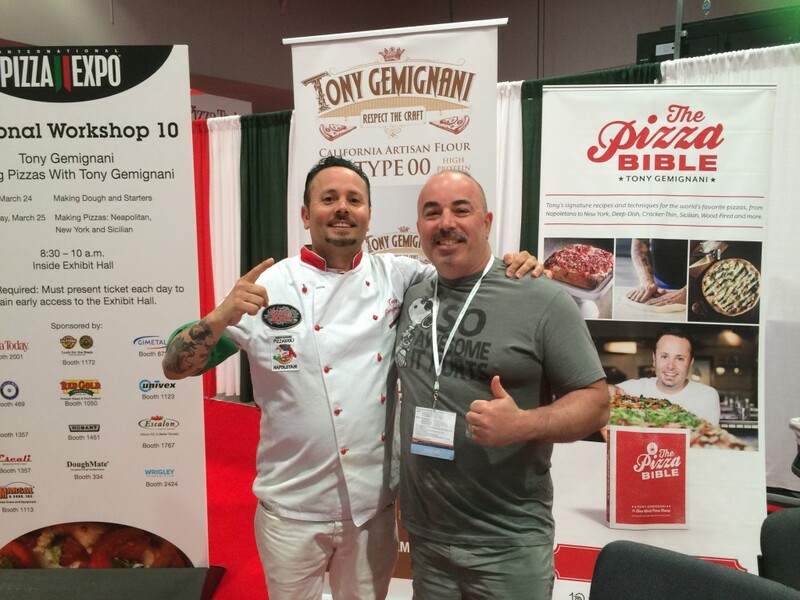 Having read the pizza bible through and through, it was nice to hear Tony expound and answer questions we all had. We tasted the pizzas made from the dough on day one and I have to say, his Sicilian is off the chart. Best I’ve ever tasted. Should you take the course? Absolutely! I look forward to it next year and will attend his school to become certified. There is so much to learn and know. If you just do what you do and aren’t interested in bettering your craft, prepare to be passed by. This is what I took from his experience. Antonio’s will never stop improving; my mind doesn’t stop innovating and with resources like Tony available, LOOK OUT! What about the rest of it? OUTRAGEOUS! The very first feeling upon entering the convention center is one of being overwhelmed. The size of it alone reminds me of the first time you ever visited a home depot. Wowwwwwww. That’s what I did. Go left of go right? Right it was and I started at the far right side. It literally took me until the end of the second day to get through it. There were several “it’s a small world” moments. 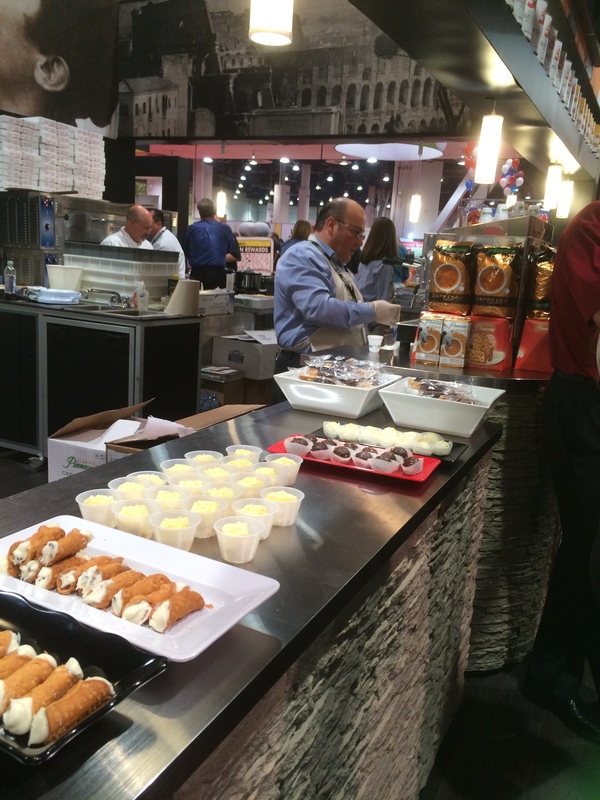 In visiting with the many food vendors, I found many were from Colorado or New York City! We knew the same things and the same people. Then there was Marsal Ovens from Lindenhurst which is two towns from Amityville where I grew up. I recognized them. 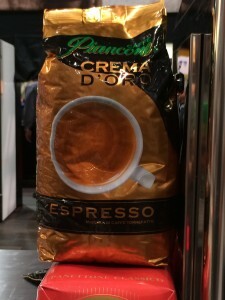 Then there were several pizzeria owners from CO that I recognized and we all chatted over espresso. The best Italian blend I’ve ever tasted was Piancone’s. You have to try it. There was Ralph and Carmela from Broomfield’s “Original Pizza” who chatted with me not as a customer, but a fellow owner. They asked to see pictures of our pizza, we chatted some more, drank more espresso and spoke some Italian. We had eaten there many times and it was Ralph who offered to teach me his way of making sauce some years ago after seeing how passionate I was about making pizza. At that time, I didn’t think there was a restaurant in the near future but it was a sign I shouldn’t have missed. 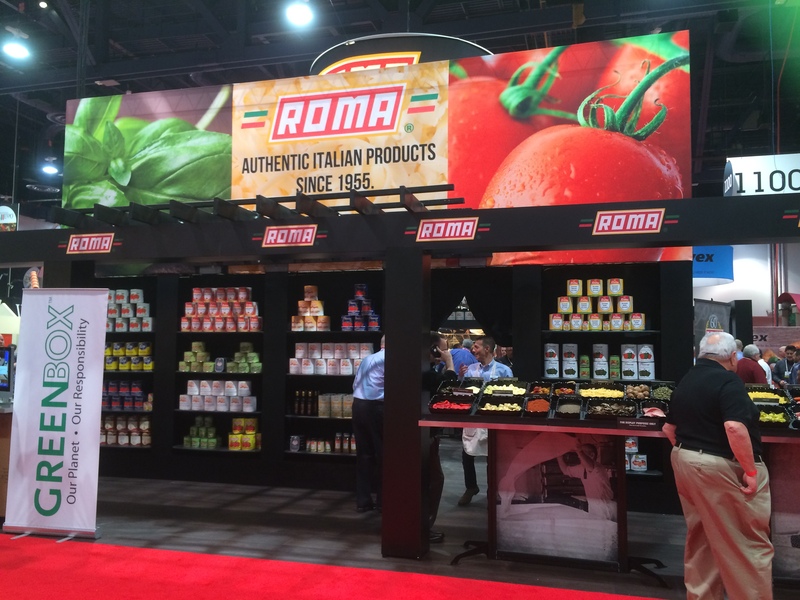 Ralph introduced me to one of the guys from Roma foods and we talked for the better part of an hour. They have some fantastic products that I will be using. The most rewarding part of the entire trip? The warmth of the attendees and the exhibitors. It felt like I was back in the old neighborhood! Italian being spoken everywhere, the smells that only such a fine selection of food can exude, and hugs! Italians are loud, passionate and warm. I am proud to be one and was so satiated being among them. There is no question I will go back again and again. Down every aisle there was pizza being made, sauce being hawked, cheese hanging from the ceiling and food being made by the best of the best. To see the two best pizza guys in the world standing next to each other making pizza – which we get to sample – was remarkable. The amount of information that was gleaned overwhelmed me each of the days. I did 20-40 minute demos of the top 5 POS systems and it was draining. Thankfully, each evening, there was a gathering where you could unwind and discuss whatever was on your mind. The third night featured one hell of a party with live music, food and drink- all part of the show. Here I got to see the very same people unwind, enjoy themselves and cheer on competitors in the acrobatics competition. This is where people do things with pizza that appear to be impossible with anything other than a plastic frisbee. 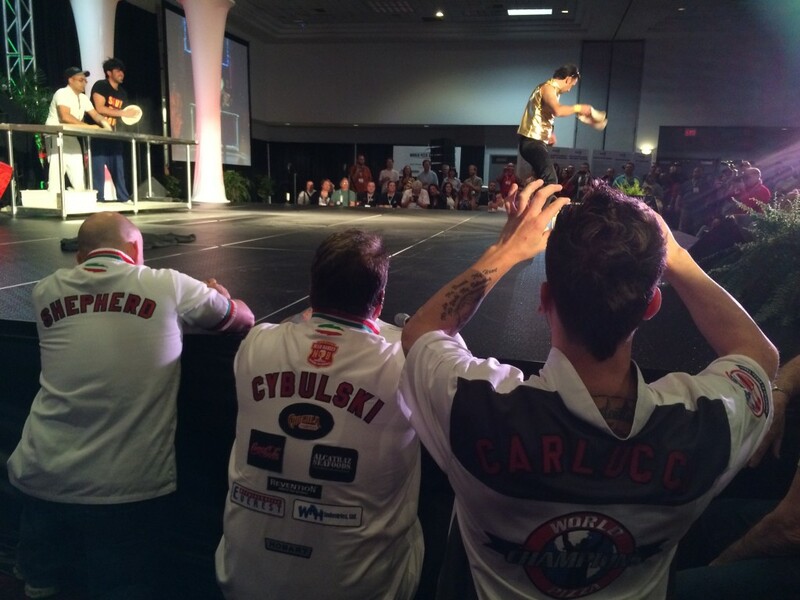 I stood behind the best competitors in the world and watched, listened and laughed. At one point, I caught a piece of dough that a competitor through and tried to work with it. Here’s when a Korean competitor walked over and tried to teach me through hand gestures- he spoke no english. This furthered my opinion of the connection shared by the group. Remarkable camaraderie. 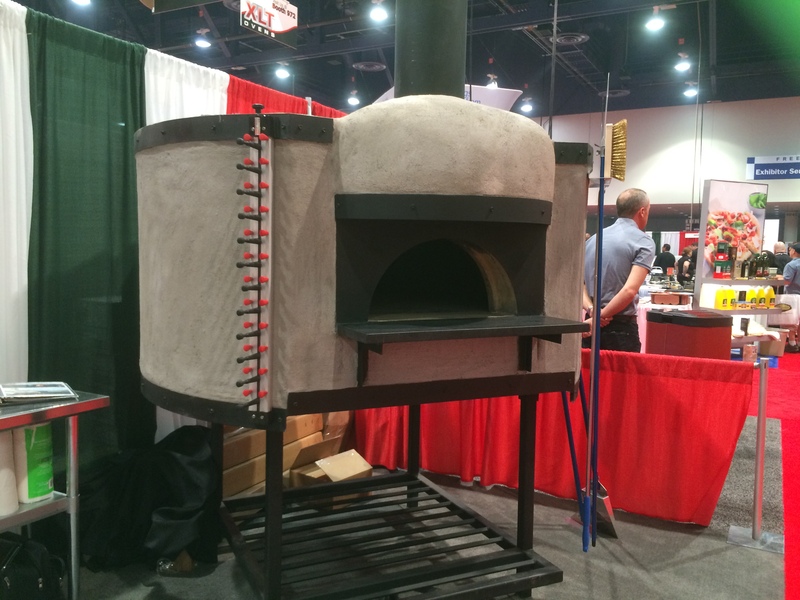 During the last day, I stopped in to speak with the guys who make world-class pizza ovens. They were so gracious it was unbelievable. I explained some of the issues we’ve had with our oven and they asked to see close-up photos. Upon reviewing them, I was then treated to a technical explanation of how our oven would work and how to rectify the issues we had. For a good 45 minutes! The moment I arrived back at the shop, the wood was arranged the way they suggested and wala, it worked. Ridiculously simple explanation for what appears to be a lifetime of observation by two brilliant men. Somehow they shared this with me without reservation. Talk about grateful! I couldn’t have been more grateful. 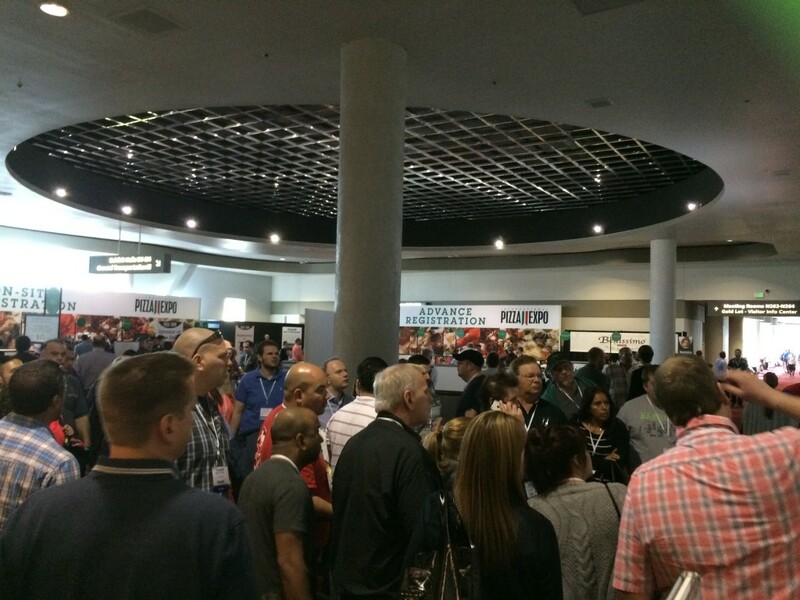 There were several excellent seminars given by top restauranteurs from all over the country. One of them was Anne Farrell from Farrelli’s Pizza in Washington. She and her daughter spoke about building employee relations, building teams, handling problem employees and vision. I ran into her after the party on our way to the shuttle bus. After thanking her for the information, she said she had been thinking about a question I hit her with all day. Then, she asked a bunch of questions about brand, what my vision was and frankly, why I’m in the business. It was amazing and I am so impressed with her leadership. It’s a shame we’re so far apart as I would definitely train with her. Immediately after this conversation, I passed out on the bus just as I would back in NYC when taking the subway home. The mind needed to power down. Overall, the trip was a resounding success, inspiring as hell because I see the opportunity and it sparked so many ideas that it will take a year to carry them all out. Paramount were three tips/lessons taken home that were immediately set into action. 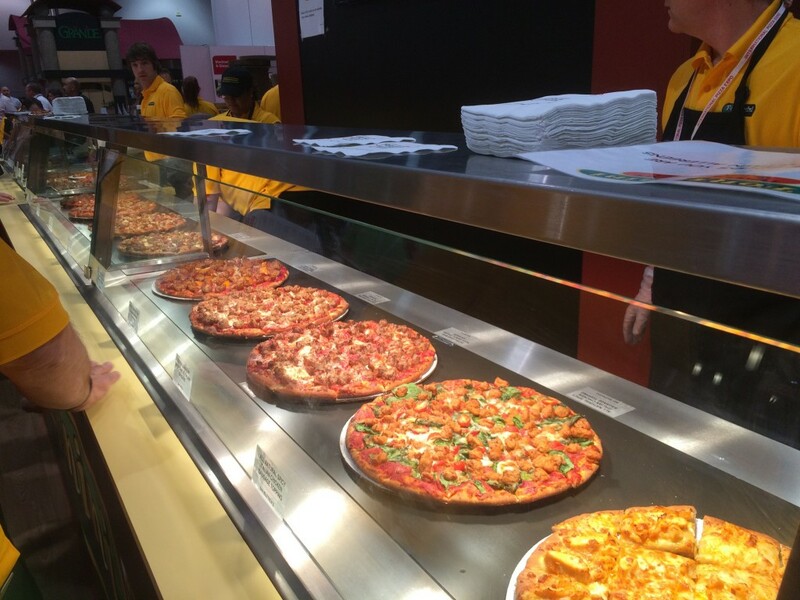 All three improved our processes immediately and improved the pizza we serve. 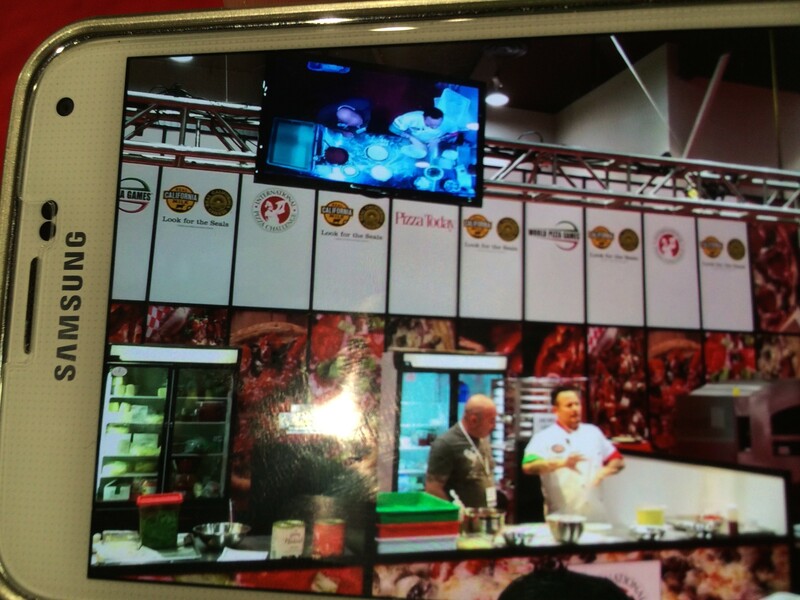 Thank you very much, Pizza Expo!